So to recap in part 1 I went through setting up the dchp server. Part 2 detailed the bash script. Now in part 3 I will post the entire bash script. I am doing this in its own post because Part 2 is just way to much info on one post IMO. Here is the script. Please keep in mind this is my first bash script so it might not be perfect but i think it is pretty good and makes life a little easier. I hope you all enjoy!!!!!! Update!!!!! Github link at the bottom of the post! 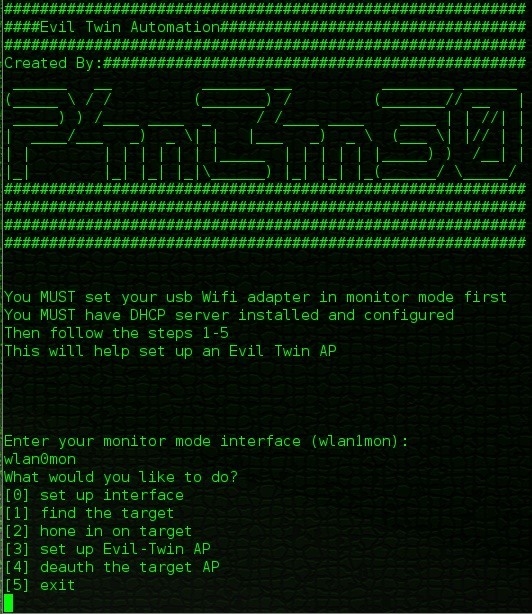 echo "Enter your monitor mode interface (wlan1mon): "
echo "Enter the BSSID: "
echo "Enter the Channel: "
echo "Write File Prefix: "
echo "No Write File Specified"
echo "Time to set up the Evil Twin AP!!!" echo "Evil Twin ESSID: "
echo "Evil Twin BSSIDoptional: "
echo "Enter the host MAC(client connected to target AP)optional: "
echo "Host MAC not set"
echo "Enter Evil Twin Interface"
echo "Enter Evil Twin Network (example: 10.0.0.0)"
echo "These next two setting MUST!!! match the setting in your dhcpd.conf file"
echo "Enter Evil Twin IPv4 Address"
echo "Enter Evil Twin netmask"
echo "Enter your internet faceing interface:"
echo "Would you like to run a basic deauth attack? (--deauth 100)"
echo "Enter your aireplay-ng options, you must add the -a tag, and DO NOT include the interface"
echo "What would you like to do?" echo "0 set up interface"
echo "1 find the target"
echo "2 hone in on target"
echo "3 set up Evil-Twin AP"
echo "4 deauth the target AP"
echo " ___ _ ___ _ ____ ___ "
echo "(__ \ / / (___) / (___// _ |"
echo " __) ) /__ __ / /__ __ __ | | //| |"
echo "| __/_ ) \| | |_ ) \ (_ \| |// | |"
echo "| | | | | | | | |__ | | | | | |__) ) /_| |"
echo "|| || || ||\___) || || |(___/ \__/ "
echo "You MUST set your usb Wifi adapter in monitor mode first"
echo "You MUST have DHCP server installed and configured"
echo "Then follow the steps 1-5"
echo "This will help set up an Evil Twin AP"
#echo "you selected $uI hello"
How To: Evil Twin (Part 2) - Creating the Bash Script. i cant move the post some one else will have to do that. i dont wont to recreate and have a duplicate post. Sorry about hat didn't realize i wasn't in the how to's section. Your welcome! Let me know if you have any suggestion if/when you try it out. To the admins of the site. Is it possible to move this post to the how to section instead of inspiration? If not can i delete this and repost under the how to's. have you set up the dhcp sever? what os and version are you using? if your using Kali 2.0 your wifi adpater is wlan*mon where is the number. and not wlan*. im using kali 2.0 , i have 2 wifi card both support packet injetion and monitor mode , but monitor mode i set up with iwconfig "interface" mode monitor, and it works perfectly, on of the wifi card is TP-Link TL-WN722N chipset Atheros dont remember serial number. then run airmon-ng start wlan2. when my evil-twin script starts it will ask you to enter the monitor mode interface. in my case i would enter wlan2mon. I just went through a complete install of Kali, set up the dhcp and then ran the script seems to make it wall the way through. If that doesnt work for you send me a pm. also note that you will not have to do step 0 as this is done before starting the script. when i get home from my 9-5 i will take a look at the line and see what might be causing your issue. but at first glance it seems like you have not copied all of the script. I will have a better answer for you soon. Hi guys, I´m new to this.